Good news is bubbling up about research already under way . . . on a promising fuel alternative that derives from algae. Algae naturally produce oil that can be processed and blended with petroleum-based fuel to make a biodiesel. And though there are many hurdles between the current state of this science and the point at which production can begin on a commercial level, the scientists and engineers at work on algae-based biodiesel are progressing by leaps and bounds. 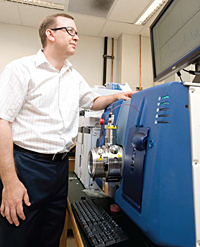 Professor John Morgan reviews results from a liquid chromatograph/ mass spectrometer. That file is about to get even fatter. Researchers at Purdue and Iowa State have won a highly coveted, $4 million grant through the American Recovery and Reinvestment Act to add to the body of research on C. reinhardtii and use it to explore this hopeful energy technology. Morgan outlines the targets for the three-year grant: to increase the algae’s growth rate; to broaden the thermal tolerance of the algae, particularly so that it can be made to grow at higher temperatures; and to increase the algae’s lipid content by overexpressing the genes that encode for enzymes in the lipid biosynthetic process. Morgan likes the straightforward nature of the underpinnings of this potentially revolutionary technology. “Science doesn’t have to invent some brand-new pathway,” he says. Compared with some other proposed solutions to the energy problem, algae-based biodiesel is one predicated on principles that have long been understood. C. reinhardtii naturally stores its excess metabolic carbon as both starch and lipid. Normally, some of the algae’s energy is put into starch and to fuel the self-propagation of the cells. It wants to reproduce itself. But for algae processing to be worthwhile, the cells need to produce more oil, not sugars. This is the problem Morgan is working on: how to induce these algae to shift a majority of carbon storage to lipid production, maximizing the yield of oil. 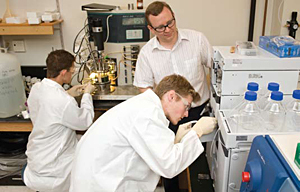 John Morgan (standing, center), and graduate assistant John O’Grady (left) set up the liquid chromatograph/mass spectrometer for analysis of the metabolism of algae cells. In the foreground, Cameron Hill, graduate research assistant, samples the photobioreactor. Morgan’s particular task is pinpointing the fate of that valuable extra carbon in the algae cells using something known as metabolic flux analysis. He uses a metaphor to explain this process: “We’re basically making a traffic map of the molecules within the cell, like a GPS.” Metabolic flux analysis provides the genetic engineers a snapshot of the molecular pathways within the algae’s cells, pointing out where the “roadblocks” are occurring. With this information, the genetic engineers on the team can increase certain enzymes to “widen the road” and, to round out Morgan’s transportation analogy, they can add new enzymes to “build new roads.” It is the ability to monitor the molecular movements within the algae’s metabolic pathways that enables researchers to manipulate the critical lipid production. And how will Morgan and his colleagues know if they have achieved the optimal lipid yield? Before they began the bench experimentation, they used mathematical simulations to suggest ideal scenarios of how best to coax the algae into producing the most oil per day. With the help of sophisticated computer modeling, they generated three or four hypothetical best cases; each will spur a round of genetic engineering to see which formula of enzymatic controls best boosts lipid production. Right now algae are being cultivated in bioreactors, a situation that limits the economic viability of algae-based biodiesel. “Ideally, we’ll eventually want to be able to grow the algae in outdoor ponds,” Morgan says, acknowledging that using bioreactors to grow algae is very expensive. But once algae is moved to the wild, so to speak, it becomes more difficult to control the purity of the medium. Bacteria like to feast on algae, for example. That is why being able to grow the algae at temperatures that impede the growth of these predators would be a key to success. Side benefits have been identified in conjunction with algae-based biodiesel production: the use of waste-product biomass as animal feed, particularly in aquacultural industries. Algal waste makes excellent fish food, for example. It can be used in fertilizers and soil conditioners as well, contributing to its environmental promise. Extracting the algae oil is an area that other researchers are investigating, and another crucial hurdle to its commercial viability. “Harvesting algae oil right now is energy-intensive,” Morgan admits. But he notes that once the oil has been collected and processed into biodiesel, the fuel product itself is extremely easy to incorporate into the nation’s current energy portfolio. It can be pumped through the existing pipeline infrastructure and burned in today’s engines, which could operate on a 50/50 biodiesel-petroleum ratio. That compares very favorably to ethanol’s 15 percent. Morgan thinks that we are about 10 years away from pulling into our local gas station and filling up the tank with algae-based biodiesel. That’s not such a very long wait.